How wide a doorway do you need for a wheelchair? After steps and curbs, doorways are probably the biggest deterrent to independent mobility for wheelchair users. I've created pages on entrances, electric door openers and doorway options but not much on doorway width. At first thought, doorway widths are easy but there are factors that need to be taken into account. So when someone asks "what width doorway do I need for my wheelchair?" some thought needs to be put into the answer. If you look at the sketch I did (sorry, I'm no artist) you'll see two wheelchairs and two doorways. Both wheelchairs are the same size and both doorways are the same width. Wheelchair number 1 is approaching the doorway straight on from a wide open room. Wheelchair number 2 is trying to access a doorway from a hallway. As can be seen, how you approach a doorway has a great impact on how wide the doorway needs to be. Wheelchair number 2 is going to have to shimmy back and forth and may have to remove a footrest to actually get through the doorway. 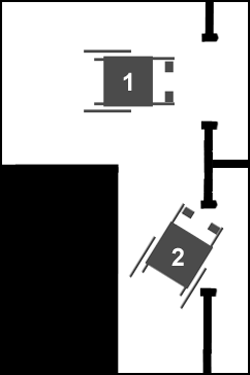 In the case of wheelchair number two the width of the hallway will affect how successful entrance through the doorway will be. The wider the hallway, the easier to swing around and pass through the doorway in a straighter angle. Wheelchairs are measured by seat size normally. So if someone refers to a 18" wheelchair they are saying the seat width is 18". Manual wheelchairs are normally 7" to 9" wider than the seat width so an 18" wheelchair will be about 25" wide. You might want to add about four inches to this width so you have room to put your hands on the hand rims so now you're up to 29". Some sport and high performance wheelchairs have cambered wheels for extra stability which widens the wheelchair even farther. Most interior doors are 30" to 34" wide but you have to reduce the measurement by about 1/4" for the door jamb and an 1" or 2" for the thickness of the door if it won't open a full 180°. Using offset hinges will solve the door thickness issue if the doorway is a little bit tight. Power wheelchairs are configured a little differently than manual wheelchairs these days. Older power chairs were configured much the same as manual chairs with motors connected tot eh wheels. Today's power wheelchair tend to have smaller diameter wheels that are tucked, at least partially under the seat. This newer configuration makes the overall width of most power wheelchairs narrower than the same "sized" manual wheelchairs and easier to maneuver in tight spaces and get through narrower doorways. Power wheelchairs are also available with front or mid wheel drives which basically means the drive wheels are on the front or in the middle of the chair. The placement of the drive wheels has no effect on passing through a doorway straight on but if turning in form a hallway it makes a huge difference. A mid wheel drive wheelchair turns from the center of the chair and basically spins in its own length as opposed to a rear wheel drive chair that require room for the front of the chair to swing around or a front wheel drive chair which requires room for the rear of the chair to swing around. So, what can you do if the wheelchair is too wide, the doorway too narrow and the approach too difficult? The wheels on some manual wheelchair models can be adjusted to narrow the overall width a little. This adjustment will involve tools and removing the wheels so it's not something you can do on the fly. If you're an inch wide and desperate you can always remove the hand rims. Most hand rims are held on using machine screws and are fairly easily removed but it means removing 6 to 8 screws per wheel. The added space needed to accommodate the user's hands is not necessarily a requirement. Most wheelchair users can grasp the door frame to pull themselves through the doorway without using the hand rims on the chair. Removing the footrests is a quick and easy solution when trying to access a doorway from a hallway that is too narrow. This assumes the user is able to hold their feet up off the ground while the footrests are off or someone is available to help support their feet.